This craft is great fun with toddlers and it is so simple to do. The boy, having overcome his initial fear, is still loving to paint and his favourite painty tool is cotton wool balls. We recently made these super cute Halloween Monster Cards and I thought perhaps it was time we thought about Christmas. I know, I know, I literally start the countdown in October! 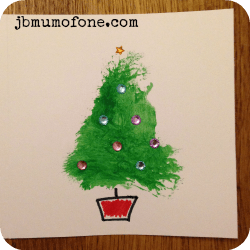 So, we decided to make some Christmas Cards and discovered cotton wool was perfect for splodging out some Christmas trees! 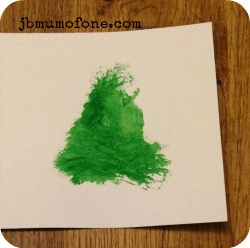 Simply splodge out your tree shape with some green paint on a white card. Next add some adhesive gems for Christmas tree baubles and lights, not forgetting a star for the top. Finally I drew in a pot. 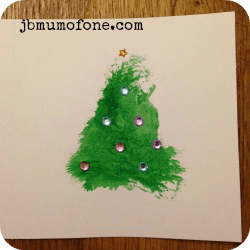 Super simple homemade Christmas cards that I am sure the grandparents will love to receive as much as the kids will love to make. For more ideas why not check out my Crafty Toddler Fun Page here or follow me on pinterest. Linking up to The Sunday Showcase. What is this ‘adhesive’ word you are using so flippantly? It sounds rather vulgar and American to my British sensibilities. Apologies, ‘sticky-back gems’ ;). We can send you one if you like! Oh how lovely – what a great idea. I’m writing a post on cards and shall feature this if that is ok. Thanks Kim. The boy enjoyed making them. These are lovely and, frankly, not just for toddlers! I might have a go at doing them myself! 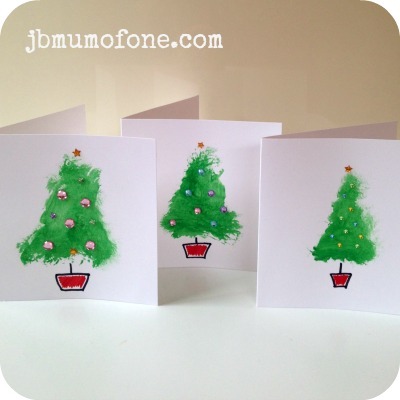 Thanks so much for popping them onto Festive Friday, they are a beautiful addition! Thank you for hosting! I think there is something quite special about homemade cards. So many lovely posts linked up here, am feeling very festive now! Thank you. We had some fun making them, though we got green paint pretty much everywhere! 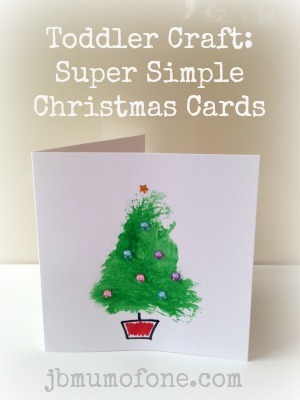 we love making our cards in this house, birthday’s, seasonal and thank you’s the lot. will pin this for this year! Another great and simple craft idea Jen! Fantastic #pinterestparty Pinned! I was looking for card ideas for kids the other day but with no great luck, but this is perfect! Thanks! Pinned it too!